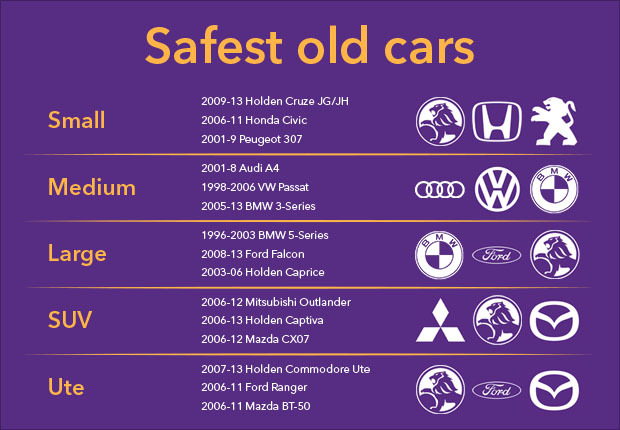 Based on ANCAP safety ratings and real-world crash data, we have found the safest new and used cars on the market. But safety is so much more than just a rating. So what else comes into play in making our roads safer for those inside and outside the car? Based on real-world crash data from 1996-2013, the National Roads and Motorists' Association (NRMA) have found the safest used cars based on the overall protection they provide to all road users in the event of a crash. 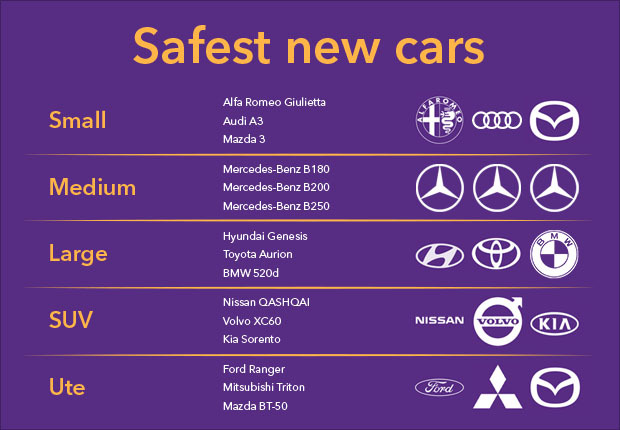 The 2016 models have been rated as the safest new cars in Australia after earning the highest ANCAP safety ratings of all 2016 model cars. The Australian New Car Assessment Program (ANCAP) is an independent safety testing body that provides consumers with transparent information on how vehicles rate in terms of a range of safety checks they run in the most common types of vehicles crashes. They test all new vehicles, and score them both a rating out of 5 stars, and a total score out of 37. So what do they look at, and how does a car score a 5-star safety rating? ANCAP also measure a cars ability to avoid a crash through the safety technology that it possesses. To achieve a 5-star rating, the vehicle must achieve a high level of safety across all tests and assessments. To read more about what the ANCAP tests involve, click here. Ready to upgrade to a safer car? Give a stratton finance consultant a call on 1300 STRATTON or complete an Online Enquiry. New tech, colour and some common sense are all important factors in making our roads a safer place. So if you want to rely on more than just an ANCAP rating, these are some features and behaviours you can incorporate every time you drive. A study by Monash University found that white and yellow cars were involved in significantly less car accidents than black and blue cars. Black and blue cars, which rated lowest on the visibility index, were also the most likely to be hit by other vehicles. Technology is becoming more prevalent in improving car safety, here are three every day features that are keeping us safer on our roads. We've all been there. You're travelling too close to the car in front and have to slam on the brakes..and it's too late. Rear-to-front vehicle crashes can cause serious damage to both your car and the people inside. AEB sensors detect when the speed you're travelling and the distance between you and the car in front will likely end in a collision, and the car independently brakes for you. Whether it's another vehicle, or a cyclist, it's all too common when driving that something seemingly comes out of nowhere when we're looking to change lanes. The Volvo S80 was the first car to introduce Blind-Spot Detection back in 2007. The system produces a visual, physical or sound alert when the driver attempts to change lanes whilst there is a vehicle, cyclist or pedestrian in their blind-spot. Whether it's backing out of your driveway, or trying to perfect your parallel park, we've always wished we had eyes in the back of our head when driving. The Nissan Infiniti was the first car to offer a reversing camera back in 2002. In April 2014, the US government ruled that all cars must be equipped with a reversing camera by mid-2018, there has been no decisive action as such from the Australian Government yet. In 2013, pedestrian deaths made up 15% of the Australian road toll. As safety for the driver and passenger's increases, the focus shifted outside of the car to ensure that pedestrians involved in car accidents were kept safe too. Pedestrian Airbags, first offered by Volvo in their 2013 V40 model, are set off when sensors in the front bumper of the car detect that someone has been hit. This triggers the bonnet to lift up and a U-shaped airbag to cover the windshield to protect the pedestrians head in the event of a crash. Regardless of the technology, the colour, or the safety rating; the ultimate deciding factor in car safety is the driver behind the wheel. According to the Traffic Accident Commission (TAC), 20% of fatal accidents on the road involve a driver who is fatigued. A driver who has been awake for seventeen hours has the same likelihood of being involved in an accident as a driver who has a blood alcohol content (BAC) reading of 0.05. The answer to minimising the risk? Ensure that you are well-rested before you drive, and if you are feeling drowsy during your journey, either ask a passenger to take a turn driving, or pull over to the side of the road and have a power nap. Although illegal BAC readings were introduced into Australia more than twenty-five years ago, drink driving is still a major issue for road safety. With alcohol being a major factor in around 30% of fatal car accidents across Australia, the solution to this issue is a simple one - don't drink when you know you will need to drive. If you know you will be drinking, organise a lift home with a designated driver or in the back of an Uber. 32% of Australian drivers admit to reading a text message on the road. Looking at your phone for just two seconds whilst travelling at 60km/h means that you are driving with your eyes off the road for more than thirty-three metres. In 2014, mobile phones became a bigger danger on our roads than not wearing a seatbelt. Avoiding the temptation is easy. Keep your mobile phone out of reach while you're driving, preferably on silent. If there is a text or a call that can't wait, pull over and park before reaching for your phone. Although an ANCAP rating is important when choosing a new car, it isn't the whole story. With the introduction of new technology, our cars are becoming safer to drive and have on our roads. By combining these features with some good old common sense, we can all play our part in making our roads a safer place. Ready to upgrade to a safer car? Give a stratton finance consultant a call on 1300 STRATTON or get an Online Quote in just 60 seconds!